Take full control with the new Show Designer 3. This advanced lighting board is based on the successful and easy-to-use Elation Professional Show Designer 1 & 2. The Show Designer 3 expands on the existing features and adds several others. 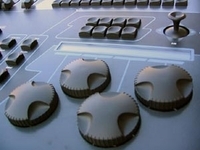 The approach of this controller is to try to simplify the programming process as much as possible while still offering a high level of control at an affordable cost. This full size universal DMX controller offers you both power and flexibility for all your programming applications. The Show Designer 3 makes programming simple and fast. A Compact Flash drive makes backing up programs, adding fixture profiles and software updates a snap. The latest fixture profiles can be downloaded off the Elation Professional website. Experience the power and take control with Show Designer 3 today! Conventional dimmers can be included in scene memory or be independent. Scenes, shows, chases and presets can be assigned to the playbacks. 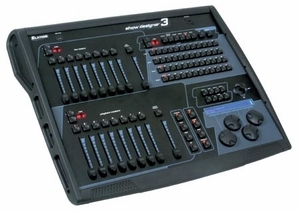 8 flex faders with page selection for moving light channels, conventional dimmers or additional playbacks. CF-drive for memory back up, loading fixture profiles and software updates. Weight: 37 lbs. / 17 kgs.